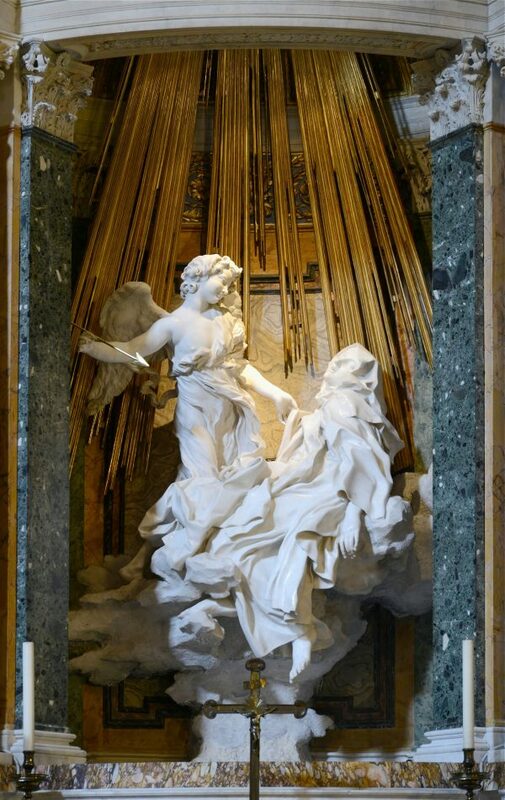 Between the years of 1647 and 1652, Gian Lorenzo Bernini produced what is considered his greatest sculpture: “Ecstasy of Saint Teresa.” One of the greatest artists living at the time, Bernini found his reputation tarnished after a mishap during the construction of the basilica of St. Peter’s Cathedral. It was later proven that he wasn’t at fault. In this vision, Saint Teresa tells of an angel who pierces her heart with a spear. The wound from this spear causes her to feel the ecstasy of God’s love and the pain from its absence. Bernini expertly uses marble to depict this vision. Rays of gold shine from above to illuminate the scene. The angel, depicted as serene and peaceful, is lifted by the softness of clouds and gently holds a long, golden spear in his right hand between his thumb and finger. The spear is aimed at Saint Teresa’s heart. She is presented in a state of ecstasy: Her eyes are closed, her head is drawn back, and her lips are parted. It is safe to assume that Bernini chose to depict this event after it had begun, since she describes the angel as plunging her with the spear “several times.” But what does this all mean? The contemporary understanding is to associate Teresa’s visions and Bernini’s depiction with eroticism. In the early 20th century, the founder of psychoanalytic theory, Sigmund Freud, popularized the theory that unconscious sexual impulses are behind the decisions we make and the experiences we have. 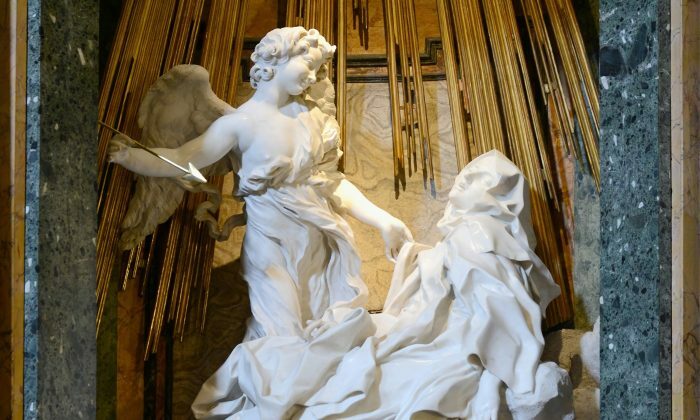 Has a Freudian interpretation been projected onto Saint Teresa’s spiritual experiences and on this sculpture? It is common across all religions and spiritual disciplines for practitioners to have mystical experiences after the sincere effort put into their spiritual exercises. The Buddha and Jesus, for example, engaged in spiritual exercises that resulted in mystical experiences, that is, experiencing nirvana, heaven, and God. In modern times, adherents of qigong disciplines such as Falun Gong also speak of mystical experiences. The type of psychological interpretation popularized by Freud serves only to limit the spiritual potential of aspiring saints. Instead, and even in opposition to this idea, Saint Teresa’s experience may be interpreted as the ecstasy that occurs when the mind, no longer attached to bodily urges, transcends the mundane and moves toward the sublime. Visions and ecstasy are a result of the spiritual discipline initiated during her life as a Carmelite nun. She elevated her heart and mind through the diligence of her spiritual discipline to be worthy of being touched by God. A Freudian interpretation seems to belittle the power of Teresa’s transcendent mystical experience to nothing more than the ripple effect of bodily urges. The visions and ecstasy of Saint Teresa were the result of a real, sincere spiritual effort and can serve as an inspiration for raising our own spirits toward what is higher and unknown.